The Incas of Cusco were originally members of a small and relatively minor ethnic groups, the Quechuas. But, as early as the thirteenth century, they began to expand and incorporate their neighbors slowly until about the middle of the fifteenth century, when the pace of conquest began to accelerate, particularly under the rule of the great emperor Pachacuti Inca Yupanqui who ruled from 1438-1471. Under his rule and that of his son, Topa Inca Yupanqui, the Incas came to control nearly a third of South America, with a population of 9 to 16 million inhabitants. Pachacuti governed his far-flung empire, called Tawantinsuyo, while consolidating his absolute temporal and spiritual authority as the God of the Sun who ruled from a magnificently rebuilt Cusco. All the Inca people collectively worked the lands of the Inca, who served as representative of the God of the Sun--the central god and religion of the empire. By the time that the Spaniards arrived in 1532, the empire extended some 1,860 kilometers along the Andean spine--north to southern Colombia and south to northern Chile, between the Pacific Ocean in the west and the Amazonian rain forest in the east. Some five years before the Spanish invasion, this vast empire was rocked by a civil war that, combined with diseases imported by the Spaniards, would ultimately weaken its ability to confront the European invaders. The premature death of the reigning Sapa Inca, Huayna Cápac in 1524, opened the way for a dynastic struggle between the emperor's two sons, Huáscar (from Cusco) and the illegitimate Atahualpa (from Quito), who each had inherited half the empire. After a five-year civil war that lasted until 1532, Atahualpa emerged victorious, but the conflict left the Incas particularly vulnerable just as Francisco Pizarro and his small force of spanish adventurers came marching up into the Sierra. On November 15, 1532, Pizarro arrived in Cajamarca, the Inca's summer residence located in the Andean highlands of northern Peru, and insisted on an audience with Atahualpa. The Spaniards demanded that the Inca renounce his gods and accept a treaty with Spain. He refused. The Spaniards began to fire their muskets and charged upon the Indians. At the sound of the explosions and the jingle of bells on the horses' harnesses, the shock of arms and the whole amazing novelty of their attackers' appearance, the Indians were terror stricken. Desperate to escape from being trampled by the horses, and in their headlong flight a lot of them were crushed to death. Pizarro's overwhelming victory at Cajamarca in which he not only captured Atahualpa, but devastated the Inca's army, estimated at between 5,000 and 6,000 warriors, dealt a paralyzing and demoralizing blow to the empire, already weakened by civil war. The superior military technology of the Spaniards--cavalry, cannon, and above all Toledo steel--had proved unbeatable against a force, however large, armed only with stone-age battle axes, slings, and cotton-padded armor. Atahualpa now sought to gain his freedom by offering the Spaniards a treasure in gold and silver. Over the next few months, a fabulous cache of Incan treasure--some eleven tons of gold objects alone--was delivered to Cajamarca from all corners of the empire. 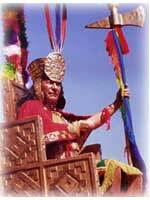 Once enriched by the Incas' gold, Pizarro, seeing no further use for Atahualpa, executed the Inca. The ruins of Machu Picchu, rediscovered by Yale archaeologist Hiram Bingham in 1911, are among the most beautiful and enigmatic ancient sites in the world. While many of the stone structures date back to the early 1400s, the 9000 ft. high mountain top itself was considered a sacred space even sooner, dating back into the mists of time. 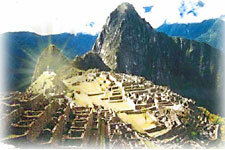 Many believe that the Inca used Machu Picchu as a secret ceremonial city. The ruins are of a self-contained citadel complete with palaces, baths, temples, storage spaces and houses , surrounded by agricultural terraces with natural springs providing an ample water supply. One of the site's primary functions was to serve as an astronomical observatory. 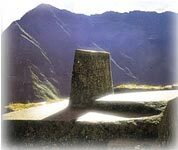 According to photographer and anthropologist Martin Gray who has made a study of sacred sitesaround the world, the Intihuatana stone atop Machu Picchu, called the Hitching Post of the Sun, is a precise indicator of the two equinoxes when the sun at midday stands directly above the monument's pillar, casting no shadow. Machu Picchu is divided into two main areas: the agricultural zone made up of terracing and food storage buildings and the urban zone which features the sacred sector with its temples, royal tombs, city squares, staircases and canals. Just outside of Cusco are the imposing ruins of Sacsayhuaman, an ancient citadel where the reenactment of the Festival of the Sun is held.